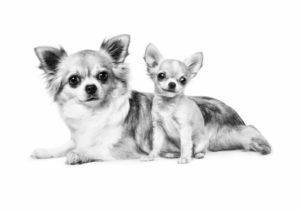 Home » Articles » Why Do Chihuahuas Shake, Even When They Aren’t Cold? Sometimes, shaking can be seen in normal, healthy dogs – particularly smaller dogs. More often than not, it is nothing to worry about. Let’s explore the reasons why the Chihuahua and other small dog breeds may shake and shiver. The Chihuahua breed hails from Mexico, a warm country with mostly sunny weather. The Chihuahua has adapted and evolved over time to deal with living in a warm climate, which is why they thrive in the UK summer but need a bit of time to settle into the winter months. Whether your Chihuahua is longhaired or short haired, their coats will be thin and light, and they have a natural tendency towards having less insulating fat, so they are more likely to feel the cold. A dog coat is often advisable for these dogs in colder weather. There may be a number of behavioural reasons why Chihuahuas and other small breed dogs shiver and shake. Bursts of excitement in these highly energetic dogs can result in a surge of adrenaline which will often show outwardly as tremors. Anxiety is also a consideration, particularly in nervous or unsocialised individuals. Whilst this behaviour is most often very normal and nothing to worry about, there are some medical conditions which can cause tremors so it is always worth discussing any concerns about shaking or shivering with your vet to ensure that this is simply normal behaviour for your dog. We hope this article helped to answer your questions about why Chihuahua’s shake, even when they aren’t cold. If you have any other questions about breeds, then we’d like to help. Submit your question below.